The California State University (CSU) Board of Trustees recently approved raises for campus presidents to match salaries from public universities nationwide, yet not all trustees were on board. 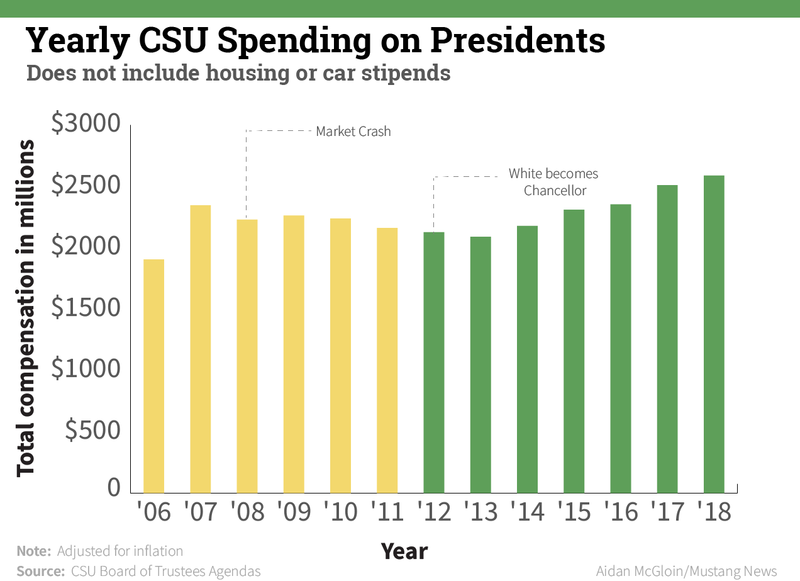 The $324,000 increase in spending due to the raises brought the total cost of CSU presidents and chancellors salaries to $10.2 million and increased President Jeffrey Armstrong’s salary to $429,915 with a $12,000 car allowance and a house. The CSU system’s governing body agreed to the raises to prevent campus leaders from leaving for better job offers. 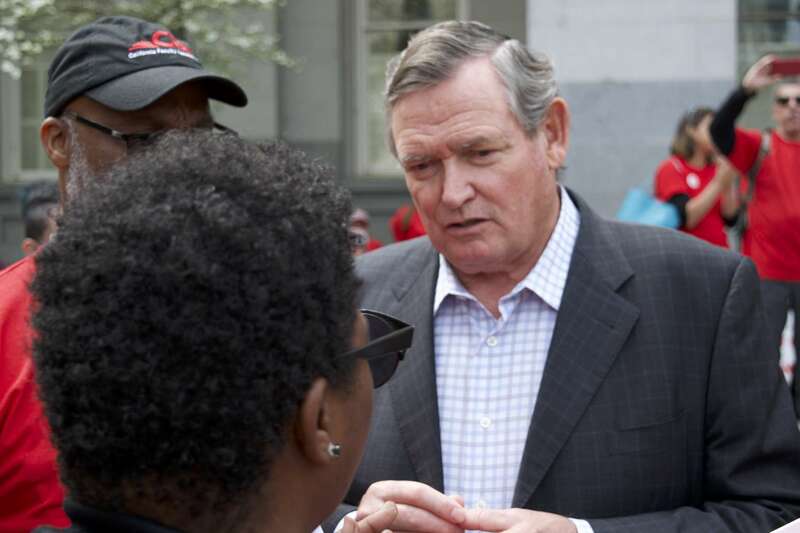 “I know that you share my belief that attracting, recruiting, retaining quality leadership for the Cal States is a significant concern,” CSU Chancellor Timothy White told the Board. However, not every member of the Board thought presidents were likely to leave for better salaries. 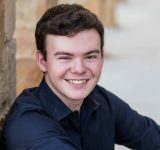 “We may be trying to fix a problem that so far doesn’t exist,” Trustee Douglas Faigin said. Concerns were voiced by both Gov. Jerry Brown and California Speaker of the House Anthony Rendon. “This is not the kind of increase that the California State University system can afford weeks after it was warned of cuts to vital programs that serve its mission,” Brown wrote in a letter to the Board. 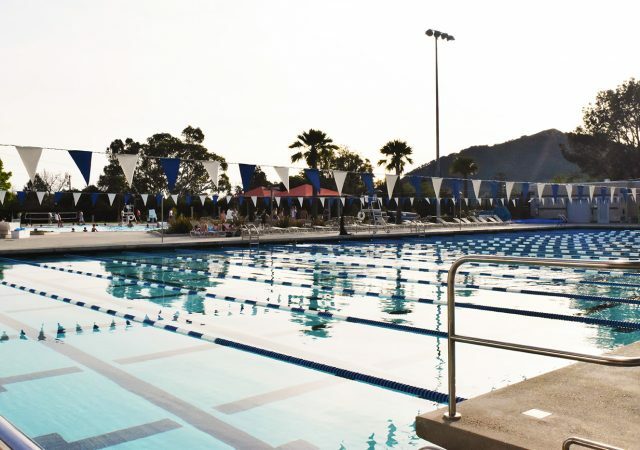 Armstrong had no input on his salary and declined to comment, Cal Poly spokesperson Cynthia Lambert said, because the raises were a systemwide initiative. No CSU president discussed the raises, according to CSU Director of Public Affairs Mike Uhlenkamp. CSU policy requires salaries to be guided by comparison institutions, or schools with similar enrollment, budget, pell grants and other factors. The institutions have been chosen by Sibson Consulting, a private human resources and benefits firm contracted by the CSU system. 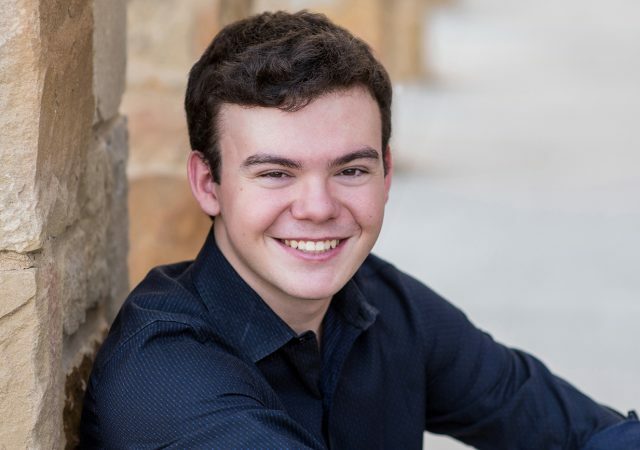 Sibson compared Cal Poly to the University of Maryland, Baltimore County, Cleveland State University, James Madison University, Ball State University, Portland State University, Boise State University and Illinois State University. Presidents of universities in this comparison grouping have an average salary of $440,894, according to Sibson Consulting. The other seven CSU presidents in Cal Poly’s mid-sized grouping have salaries between $350,000 and $300,984, far below average for their group. Out of all 24 CSU presidents, only five are close to their group’s average, and none are above. 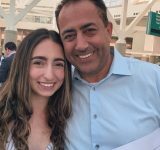 For large-sized CSUs, only the president of San Diego, with a salary of $428,645, is close to the comparison average of $499,680. The other presidents are paid between $380,275 and $324,029. 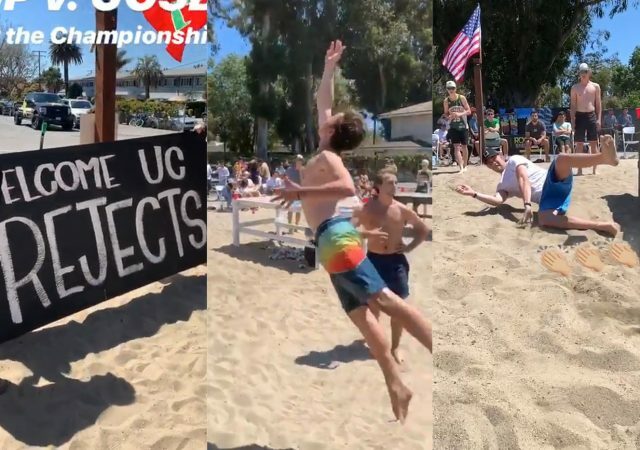 Three of the seven small-sized CSU campuses, with presidential salaries between $327,181 and $305,450, are close to their group’s average of $357,219. The other four presidents receive between $296,614 and $271,601. Average compensation for public university presidents nationwide is approximately $437,000, according to the Chronicle of Higher Education. Although the pay raises are to ensure that executives do not leave their positions, they can ask for salary decreases. 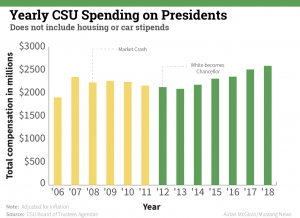 When White joined in 2011, he requested and received a 10 percent pay cut because, he said, he understood the financial difficulty for CSU employees and students. 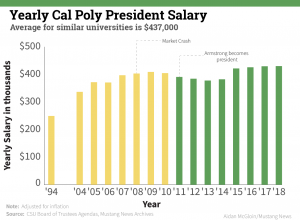 Professors in the CSU system are paid at the market average, according to Sibson Consulting, but Cal Poly has been hiring less professors over time. According to the Cal Poly Fact Book, there were 10 less professors at Cal Poly in 2017 than there were in 2007. 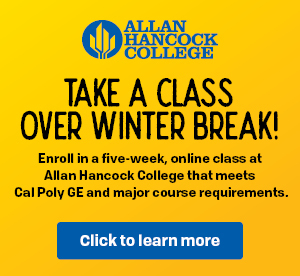 Cal Poly has hired temporary faculty to make up for the shortage, but they are paid less money, do not have guaranteed work and are not considered in Sibson’s analysis. Sibson Consulting’s exclusion of lecturers shows an incomplete picture of faculty pay, according to Call. Call referenced the slow pay growth for the CSU system faculty detailed in a 2017 auditor’s report. The report called for stronger oversight of the CSU system’s budget and reiterated past recommendations to decide presidential pay from total compensation, not just base salaries – which is how the Board currently measures pay. Average compensation for CSU faculty also grew the least between 2008 and 2017, according to the audit. Average compensation for presidents and chancellors increased by $20,804, or 6.3 percent, while average compensation for faculty increased by $1,871, or 2.8 percent. That relates to $1.3 million more spending on presidents and chancellors and an additional $128.6 million on faculty. Is president turnover a problem? 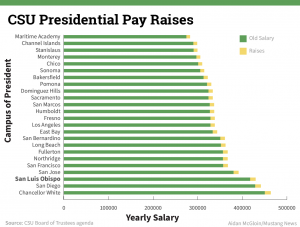 The only three presidents who left the CSU system recently for a reason, excluding retirement, received a pay increase the Board could never provide, Faigin said. “All three of those presidents left for compensation that were far, far beyond anything that we could even, that we’ve been considering, or have ever considered,” Faigin said. A presidential turnover analysis has not been conducted, so there is little evidence that more pay is necessary to retain current presidents. 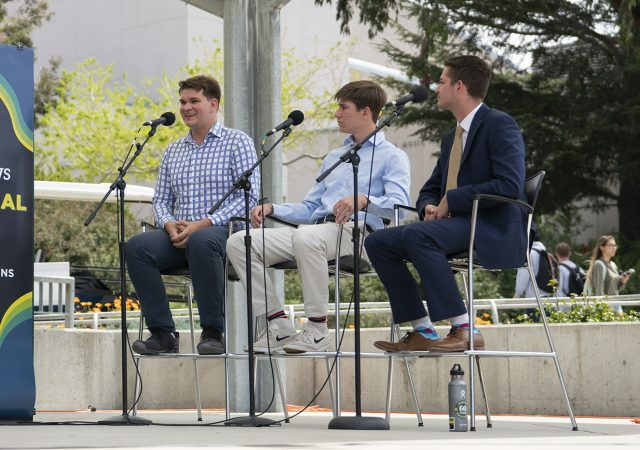 Supporters of the raises argued that if they did not give raises, other organizations could outpace the CSU system later on, even if they are not currently taking away presidents. 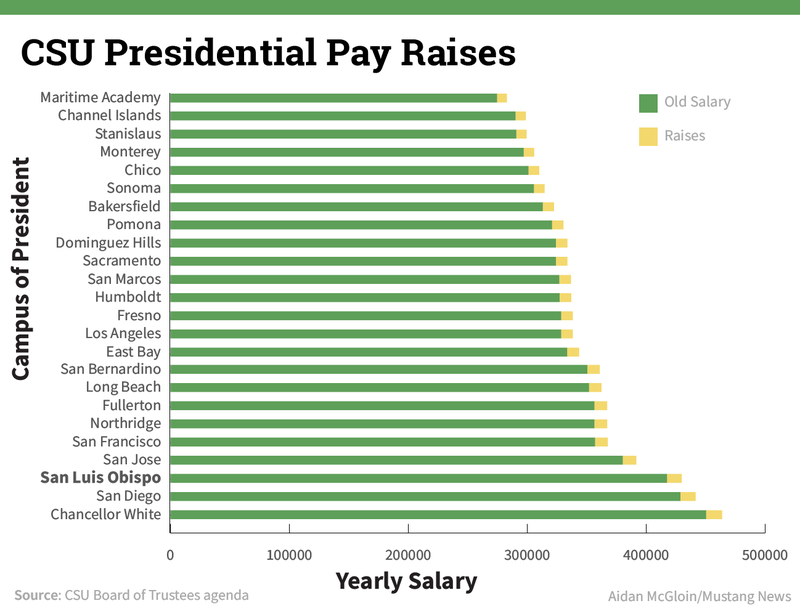 “If we’re in a position where we don’t give presidents raises for years and years on end, inevitably you’re going to be in a position where that base salary is so low that you just can’t possibly compete for talent,” Trustee Peter Taylor said. 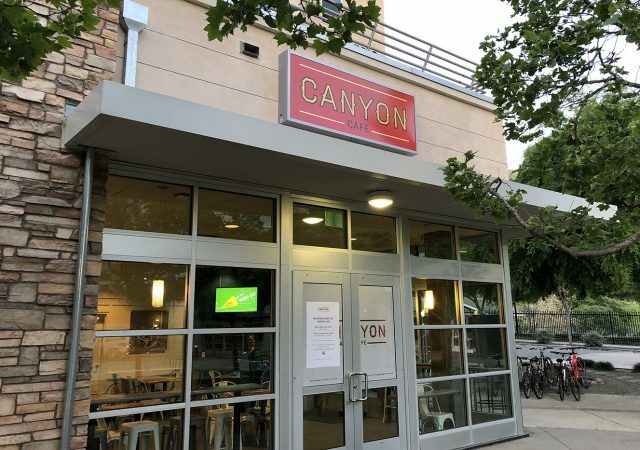 Only 6 percent of tenure-track faculty left the CSU system after five years, according to a 2014 Sibson Consulting analysis, which is 10 percent below the national average. Yet the comparison excluded lecturers and has no comparable study with CSU presidential turnover rate. Trustee Jane Carney asked for turnover comparisons in discussions to create a new spending policy, saying she believed faculty had higher turnover than presidents, but would like to see data to confirm it. “We haven’t had high turnover over the presidents other than those who just retire,” Carney said, adding that the Trustees should increase salaries to recognize the president’s work. Sibson Consulting recommended four models to improve compensation rather than general across-the-board raises in the Board of Trustees’ discussion to change the executive salary policy. 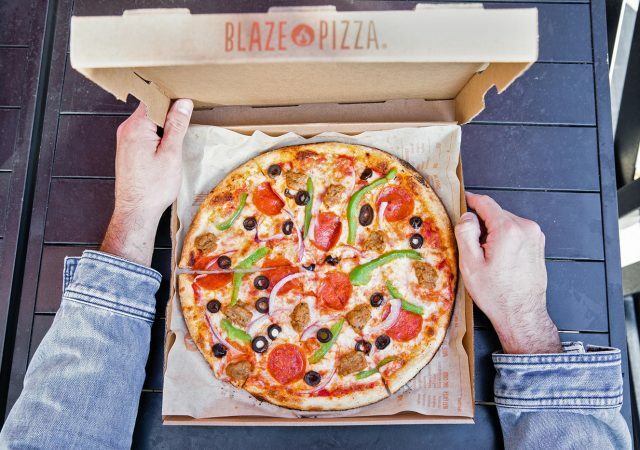 One of the models would have brought all CSU presidents’ salaries to 85 percent of the average salary among peer institutions and would have cost $975,000. A second model would have cost $2.2 million to bring all presidents to the exact average among comparison institutions. The third would have tracked all presidents to a percent of the market average based on years of service and the fourth would have tracked all presidents to a percent above the average based on years of service. 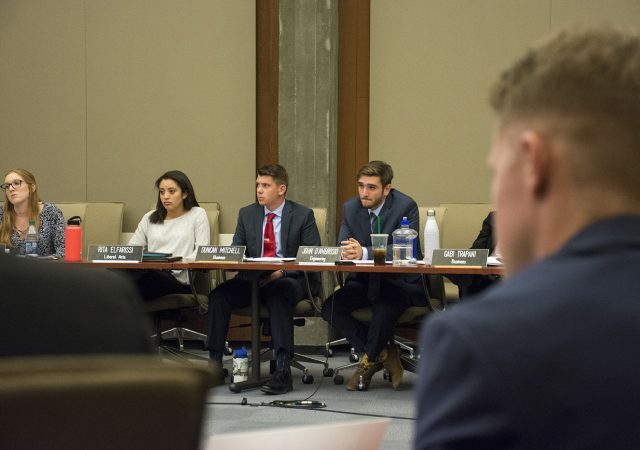 Sibson recommended the first model, but the Board of Trustees delayed the vote after they asked the firm to compare salaries against total compensation of other campus presidents. When doing so, they only compared base pay and ignored house benefits, foundation pay, car stipends and other forms of payment. The auditors recommended looking at total compensation in both a 2011 and 2017 audit of the CSU system. 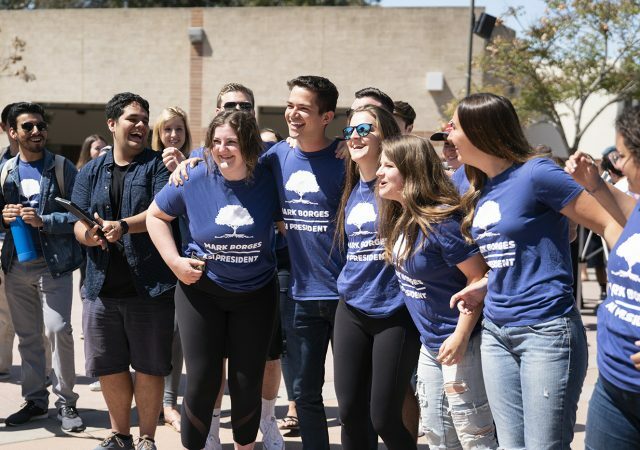 A hard-fought budget increase from the state of California may not have happened if the Board of Trustees had mentioned it would spend $324,000 on executive salary raises, California’s Speaker of the House Anthony Rendon said. The new state budget granted the CSU system an additional $179 million after adjusting for inflation. The raises only took up 0.2 percent of the budget increase, but with a system that is already stressed for money, Gov. Brown urged a vote against the pay increases. “As the representative of the legislature on this board, I must say that this idea was never part of our calculus when we considered the budget. 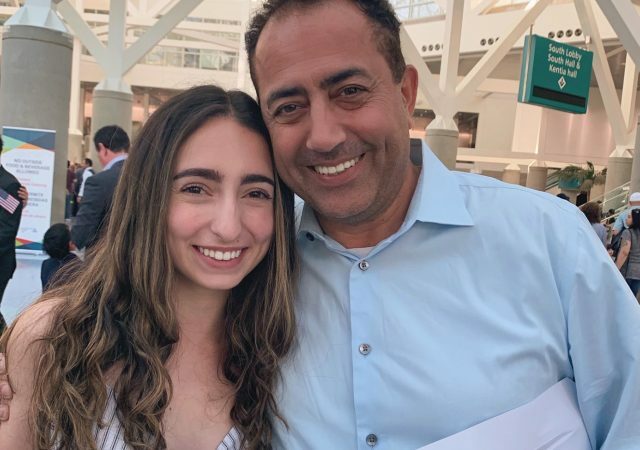 When we considered the budget over the course of a six-month process, when we finalized the budget in the final weeks and the final days, this was never part of our calculus,” Rendon said.